SORRY, THIS CLASS is FULL. CHECK BACK NEXT MONTH TO SEE OUR NEXT ONLINE PROJECT. 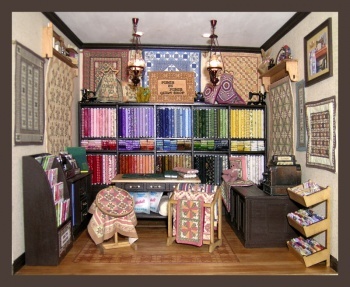 Our current class and kit is our wonderful 1/12" scale quiltshop, called "Piece by Piece". We originally offered this 3 years ago and everyone loved it. It's our most popular pin on pinterest, and we have a waiting list of interested students, so I think it's time to do it again! I can say with all confidence that no one has ever offered a room box kit as complete as this one! The interior measurements of the room box are 12" high, 12" deep and 14" across. 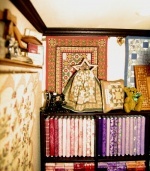 And we have filled every square inch with absolutely darling miniature fixtures, quilts, notions and more. Lets start at the bottom and work our way up... the floor is genuine cherry wood strip flooring. 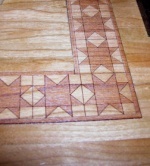 It features a custom inlaid pattern which features the traditional 8 point star quilt block which has been laser etched into strips of cherry wood. The walls are covered in a wonderful textural fabric. All of the fixtures will come to you as easy to assemble, laser cut kits. These include the focal point of the project, the wonderful full "color wall" shelving unit that fills the back wall of the room. Included with this fixture are 120 pre-cut wooden bolts and 120 pre-cut fabric pieces to wrap around each bolt. No duplicates, I have hand selected over 120 wonderful tiny cotton prints for use in this project. Pre-cut fabric is also provided for the little quarter yard flat fold pieces also stored in the back wall unit. The next fixture is the main counter, on the right. Perfect for your cash register and a nice display. In front of the main counter is our "fat quarter" bin. This will be provided as another laser cut kit and will also include pre-cut fabric pieces to fold and place in the bin display. On the left wall you will see another shelving unit which holds taller bolts of fabric, perfect for quilt backing, and has two opening drawers and a small cubbyhole perfect for a little cast iron sewing machine. This also comes in kit form including all wood, drawer hardware, fabric bolts and pre-cut fabrics. 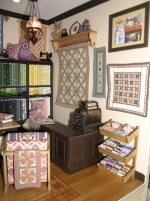 On the left front you will find our magazine display, filled with the latest of the popular quilting magazines. Kit for the magazine display is complete with laser cut wood pieces and all artwork to assemble the magazines. 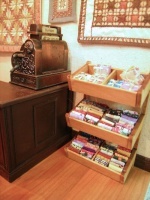 In front of the cutting table you will find a lovely quilt rack and a standing quilting frame. Both of these items are also provided in laser cut kits for you to assemble and finish. Additionally you will find on the tall bolt counter, a small wooden display unit holding patterns for the latest quilt styles. 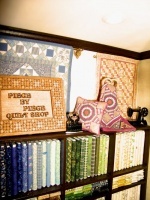 Of course, you can't have a quilt shop without quilts, and we have provided LOTS of them for you!!! Our "cheater" quilts are beautiful quilt designs, which have been scaled down and printed on fine cotton lawn. You will simply add a backing to the quilt top. You can do this by hand or machine sewing. Then you can sew over the lines in the quilt design, which will give lots of dimension to your quilt and make it look like a real pieced quilt. I've also designed a darling laser cut sign to hang proudly in your shop. The engraved quilt border surrounds the cutout wood letters and is simply delightful! 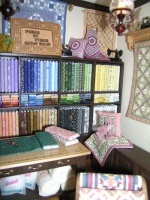 To help you display your quilts there are standing heart and star quilt stands, and two wonderful wall quilt racks with shelves, one on the right wall and one on the left. You will also receive three brass quilt rods, I've also included a set of antique notion boxes to display on the shelves, along with a cute wall clock designed in a quilting hoop. You will also receive the materials to make the rolls of batting, bags of stuffing, a couple of darling Olfa mats and rotary cutter, a beautiful print to frame for the wall, and even a tiny pair of pinking shears. The room box is well lit, with 4 inset can lights in the ceiling and twohanging ceiling fixtures. Please look at the smaller up close photos of the chandelier. We are no longer able to get the copper Heidi Ott lights originally used, and are substituting the lights shown in the close up photos. The ceiling will come to you pre-wired with these two fixtures hardwired to the ceiling. And finally, everything is housed in a handsome birch plywood box, which will be shipped to you unassembled. You can paint or stain the exterior as desired, and then add a picture frame to the front to enclose your beautiful room. The cash register, metal sewing machines, flat irons, pincushion/threadstand and tiny teddy bears and bunnies are NOT included in your kit. I'll do my best to source these things for you to purchase separately. Of course, we will provide an extensive online tutorial for this project, with photos and written instruction for each and every step along the way. And I am available by email for any support needed. Students will need to provide basic tools, scissors, glues, paints, stains and sealers. Also, an iron is essential and a sewing machine highly recommended to finish the quilts. Please refer to the additional photos below and email me if you have any questions. A limited number of kits will be offered on a first come first served basis, and about half are already spoke for by students on the wait list. Do not delay, get your registration in asap. You will be sorry if you miss out on this one! You won't find a more complete kit anywhere, and I know you will LOVE this box when you are finished!